RBTH presents a selection of views from leading Russian media on international events, featuring news of the reported withdrawal of heavy weapons by rebel forces in Ukraine, as well as reports on the possible resolution of the Kurdish issue in Turkey and the results of parliamentary elections in Estonia. 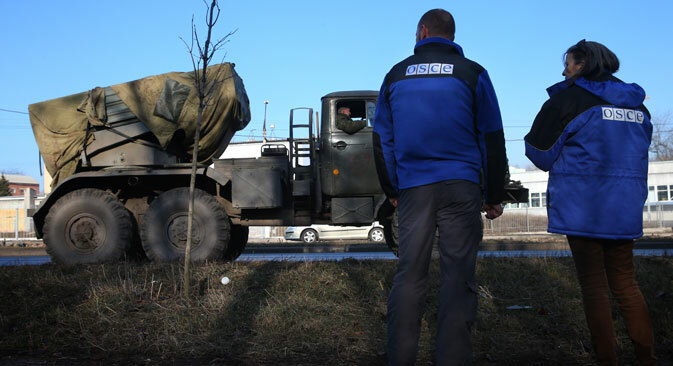 The Kommersant business daily reports that the military forces of the self-proclaimed Donetsk and Lugansk “people’s republics” in the Donbass region of eastern Ukraine have announced that they have fully withdrawn their heavy weaponry from the line of contact. For its part, the Organization for Security and Cooperation in Europe (OSCE) points out that it is so far too early to say that this phase of implementing the agreements signed on Feb. 12 in Minsk, Belarus has been completed. For their part, the Ukrainian authorities have greeted the rebels’ statement with skepticism, Kommersant adds. According to official Ukrainian spokesman Andriy Lysenko, there is no real withdrawal of weapons taking place. Instead, he added, the rebels are preparing for an offensive around the cities of Mariupol, Artemovsk and Lugansk. The centrist Nezavisimaya Gazeta newspaper reports on the appeal in which the leader of the Kurdistan Workers’ Party, Abdullah Öcalan, urged his supporters to lay down arms and reach a peaceful resolution to the organization’s long-running conflict with Ankara. The paper points out that Kurdish rebels have been fighting against the Turkish government for more than 30 years. The Turkish authorities began peace settlement talks with Öcalan in October 2012. However, two years later, Nezavisimaya Gazeta continues, Kurds held a series of street protests across Turkey, jeopardizing the chances of reaching a peace settlement. Turkish President Recep Tayyip Erdogan welcomed the Kurdish leader’s proposal, though he did not express the confidence that this move could lead to peace, the paper says. In an interview with Nezavisimaya Gazeta, Oriental Studies expert Nodar Mosaki said that the significance of Öcalan’s appeal and Erdogan’s reaction to it should not be overestimated: In resolving the Kurdish issue, Ankara intends to adhere to the maxim “one country, one nation, one language,” while Kurds from the Kurdistan Workers’ Party will not lay down their arms, despite their leader’s appeals. Political analyst and editor-in-chief of the kurdistan.ru website Vadim Makarenko, meanwhile, told the paper that Turkey now needs to find a new formula for relations with the Kurds. “The Kurdistan Workers’ Party also realizes that military methods no longer can achieve a lot and it is better to switch to peaceful political means of fighting for one’s interests,” he said. Nezavisimaya points out that Turkey, as a NATO member and a country that has recently signed an agreement with Washington on training and arming the moderate opposition in Syria, is now expected to show more zeal in the fight against the Islamic State radical group (ISIS). The RBC business newspaper sums up he outcomes of parliamentary elections in Estonia, in which the ruling Reform Party has won. The opposition Center Party came in second, with the Social Democrats, who form part of the ruling coalition with the Reform Party, coming in third. The Center Party, which was Reform’s main opponent in the election, is perceived in Estonia as a pro-Russian party, RBC continues. However, according to Reuters, it enjoys the support of only 70 percent of the country’s Russian-speaking voters. RBC recalls that in 2004, the Center Party signed a cooperation agreement with Russia’s ruling party United Russia. Last year, Center Party leader Edgar Savisaar came under criticism from the other parties over his position on events in Ukraine. In particular, Savisaar said that the Crimean referendum that led to the peninsula being incorporated into Russia was legitimate.